Chicago has NEVER had an elected representative school board. This coming Tuesday, Feb. 24 Chicago voters will have yet another chance to express their desire to bring democracy to our public school system. 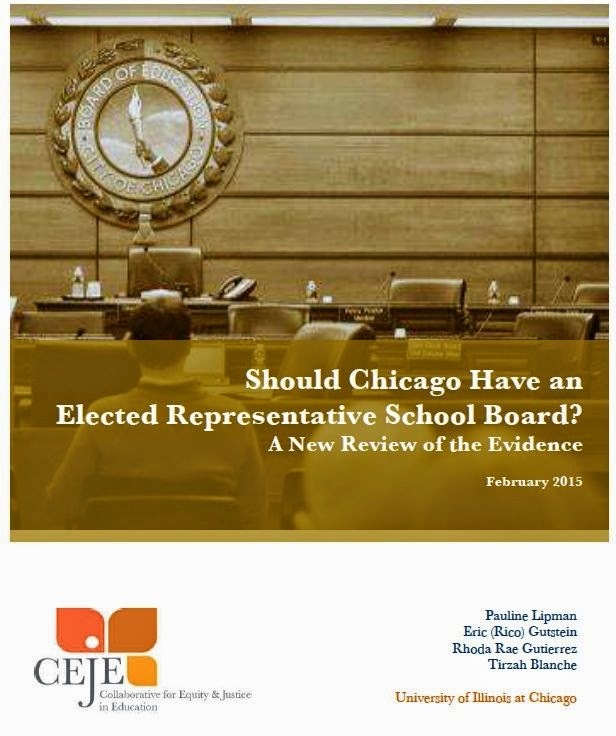 The Collaborative for Equity and Justice in Education at the University of IL at Chicago has just published a new report which sets out the evidence and makes the case for an elected and representative school board for the Chicago Public School district. Should Chicago Have an Elected Representative School Board? The full report can be viewed and downloaded here. Chicago has never had an elected school board, unlike 98% of school districts across the US, and all other districts in Illinois. Over the years it had a series of arrangements, including City Council appointments and nominating commissions. In 1995, the state legislature gave the mayor full authority over Chicago Public Schools (CPS), including the appointment of the Board of Education. After 20 years of mayoral control, the appointed Board’s policies have become increasingly contentious, and parents, community and education organizations, academics, civil society leaders, politicians, and the Chicago Teachers Union (CTU) have called for an elected representative school board. In 2012, 87% of 80,000 Chicago residents voted in 13% of the city’s precincts for an elected school board in a non-binding referendum. A similar referendum is on the February 24, 2015 ballot in 37 of Chicago’s 50 wards. These referenda and the 2013 closing of 50 schools have brought to a head the question of an elected Board of Education for Chicago. 1. There is no conclusive evidence that mayor-appointed boards are more effective at governing schools or raising student achievement. The record of Chicago’s appointed Board of Education underscores this finding. 2. Under mayoral control, opportunities to learn have become more unequal as CPS consolidated a two-tier school system. The Board prioritized selective programs and schools while neighborhood schools serving low-income students of color lost resources and bore the major impact of misuse of tests to enforce punitive accountability and narrowed curriculum, and to close schools. 3. Under the mayor-appointed Board, racial disparities in educational outcomes persisted and in some cases widened. 4. The Board’s policy of closing neighborhood schools has not improved education for the majority of affected students and has had harmful consequences, particularly for African American communities, students, and teachers who were disproportionately impacted. 5. The Board’s privatization agenda has not generally improved education. Charter and contract schools are on the whole doing no better and are more punitive than neighborhood public schools. Privately operated schools are also further removed from public accountability. However, the Board turned over one-quarter of the district’s schools to private operators. 6. Chicago’s Board engaged in questionable and risky financial arrangements and was a poor steward of public resources. 7. Mayoral control and Board structures and processes limit public input and democratic accountability. The Board has been markedly unresponsive to outpourings of public opposition to its policies and essentially indifferent to advice and proposals of parents, teachers, and others with expert knowledge and who have a primary stake in students’ education. 1. Chicago should move to an elected and representative school board. 2. The Board’s operations should be transparent and publicly accountable. 3. The Board should establish structures and practices that strengthen democratic public participation in district initiatives and decisions. 4. The Board should draw on sound educational research and educator, student, and community knowledge to develop, propose, and evaluate policy. 5. The Board should prioritize equitable educational opportunities and outcomes in all actions, policies, and decisions.